The client is a reputed tiles and bathroom ware distributor based in Adelaide, Australia, offering the world's best tiles and bathroom ware. An iconic national business with over 110 outlets, they cater to everyday Australians, as well as high-end clients including interior designers, commercial operators, traders etc. The client actively seeks out the best tiles and bathroomware across the globe, looking specifically for styles that complement Australia's unique geographies, conditions and lifestyles. With best-in-class distribution centers in Melbourne, Sydney, Brisbane and Adelaide, the client has transformed Australian homes for more than 55 years, covering everything from small spaces to expansive settings. The client required a high-volume of 3D bathroomware models for its online and print sales (ads, catalogues, posters etc.). The client needed an outsourcing partner to study and select various bathroom fittings (washbasins, bathtubs etc.) on client provided reference websites, and create 3D models for each in different renders. The outsourcing partner was also required to create the landscape view from windows and doors (example skylines, mountains etc.). Short timeline - 19 days for 15 models (30 renders). On receiving the client's business enquiry, O2I undertook a Scope of Work assessment and a quality test (trial) was scheduled. During the trial, the client sent O2I a few JPEG images via email. 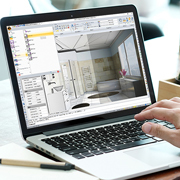 O2I assigned one full-time animation resource to study client provided websites and select bathroom ware products as per client requirements. Next, the resource created three shells using 3DS Max and Adobe Photoshop software. The process included creating multiple 3D shells, textures, layout, tiles, visualizing spaces, giving an 8K rendered output in high resolution PDF and .OBJ files, and uploading via Dropbox. The trial was successfully completed within 24 hours. Based on the success of the trial, the client signed a full-time ongoing contract to outsource 15 models (30 renders) to O2I. O2I allocated three full-time resources (from both graphics and animation teams) to handle the high-volume of images. The client was satisfied with our high-quality output and emailed us mentioning that we had exceeded their quality expectations. They also acknowledged that we had provided a hassle-free outsourcing process. Outsource2india has more than two decades of experience in the outsourcing arena including Data Management, Creative, Translation, Financial and other business services. We have a team of professionals who deliver high-quality outsourcing services at the most affordable costs. Contact us, tell us your requirement and get a free quote within one business day.